Some students learn best by listening to the lessons, others are hands-on learners, and others need visual cues to support their learning. As a teacher, it is important to implement strategies that allow all learning styles to succeed in the classroom. And as special education teachers, we have this intrinsic love and ability to support all the students in our classroom. Word walls are one quick and easy way to do just that. Students add hundreds of words to their vocabulary each school year. They learn new vocabulary across all content levels, in all classes… on class outings and field trips, in the community, at home… they learn new vocabulary everywhere. Mastery of vocabulary is essential for future skills. So developing those vocabulary skills through a word wall is the initial foundation for future growth and development. 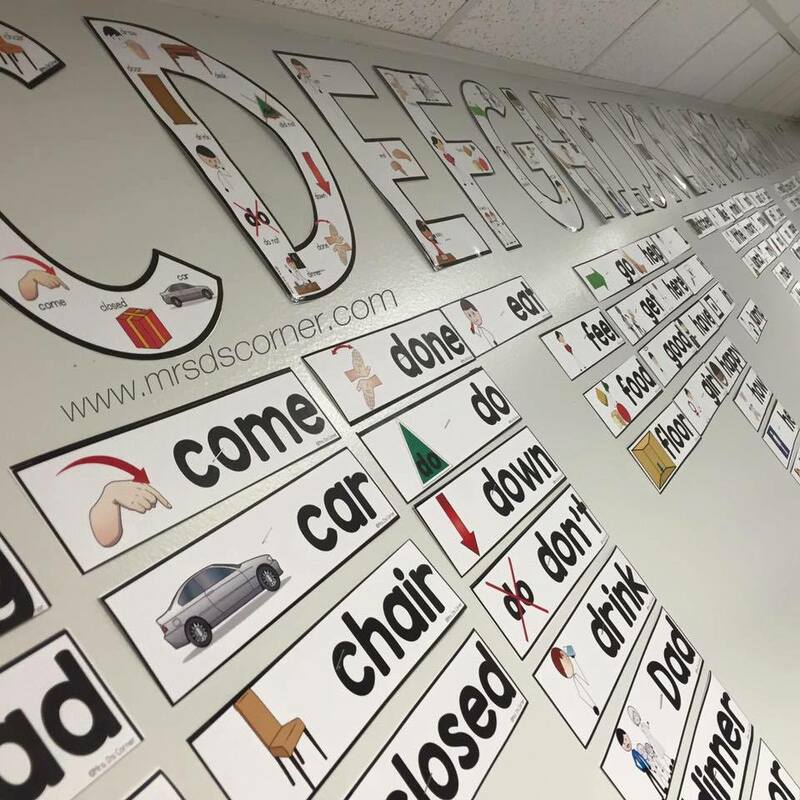 A word wall is a great way to create a visual, interactive area of the classroom for students who are learning to read, to introduce new words to students, or for students to use as a point of reference throughout the day. This area is designed as a board with a collection of words, printed in large letters to be easily seen from all areas of the classroom. Any location in the room can be used for your word wall, such as a bulletin board, whiteboard, chalkboard, or another type of display surface. Keep reading to learn more about how to utilize a word wall without an actual wall. Constant, visual cues show high-frequency words that the students are learning. The repetition helps to solidify the memorization of these words. Build the vocabulary of the students by increasing student engagement and encouraging high-level thinking skills. Seeing the words in bold lettering, side-by-side, makes it easier for students to identify relationships and patterns in the words. The activities and words build both spelling and phonics skills simultaneously. The students can refer to the word wall while working on writing and reading activities. This area of the classroom is a quick reference, increasing self-management and independence. Words can be paired with simple pictures so that the children make associations with the images and letters, especially with core vocabulary. 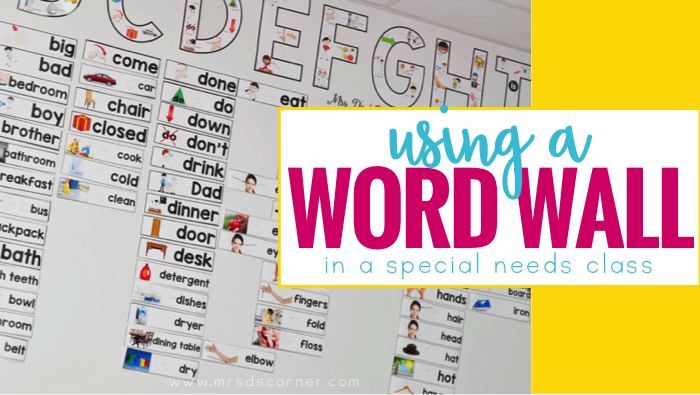 Make sure that the word wall is functional, simple and easy to understand, and accessible to all students in your classroom. Once a word wall is up in your classroom, you can refer to the wall frequently during discussions to help the students understand how to use the wall. Various activities can be integrated to encourage the students to be interactive with the word wall during their lessons. This word wall can be used daily to practice vocabulary, reading, and spelling. Look for different activities that can be used to engage with the words on the wall. If you don’t have the space for a large word wall, you can easily print any resource in a smaller size. Simply adjust the options while printing (shown in the snapshot below), and voila! Using Adobe Reader to print is the easiest way to get your settings correct (on a PC or a Mac). 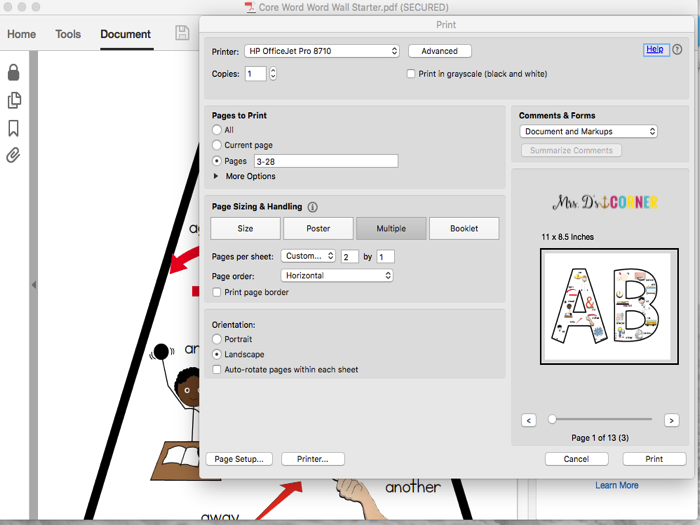 Simply choose “Multiple” and landscape page orientation to print the letters and word cards at half the original size. You can see the significant size difference in the full size and the half size. 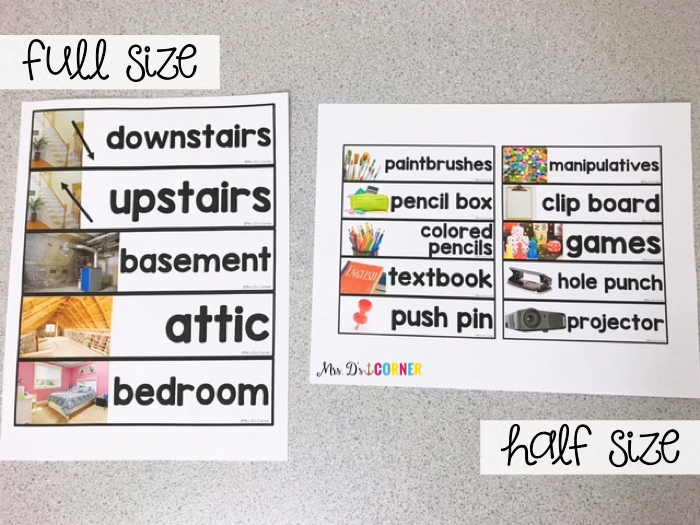 Printing the letters and word cards this way will help you save space, but also make the most of the space you do have available… making ANY size of space work! 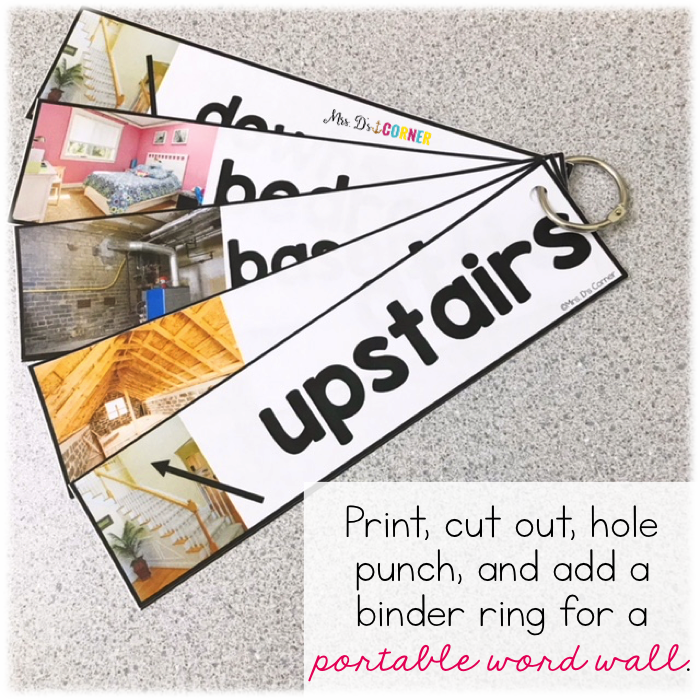 It really is my favorite – printing the word wall cards at half the original size, cutting them out, punching a hole in the top left corner, and adding a binder ring. Instant portable word wall! Students can easily take the word wall with them to their inclusion or resource classrooms. 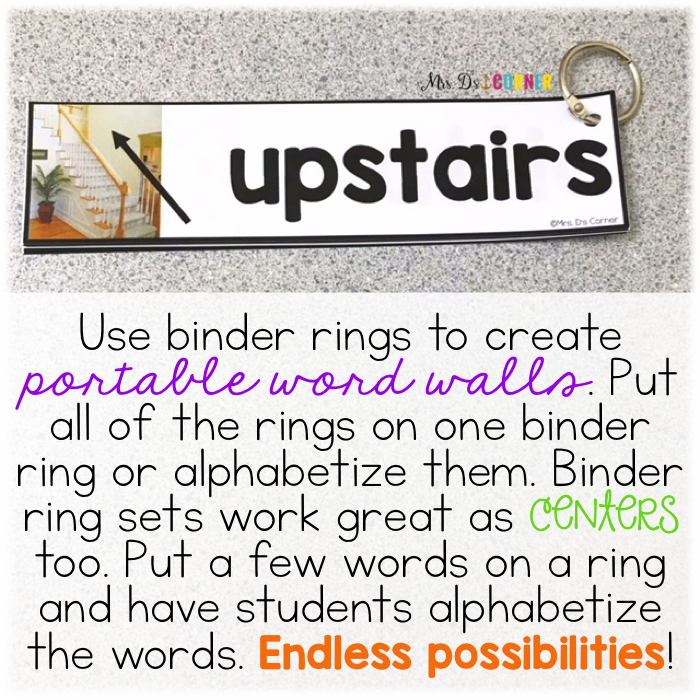 You can, also, easily create alphabet, word, or writing centers using the word wall binder rings… and with as little as 3 cards on one ring. Another option is to hang the words from the ceiling in alphabetical order, keeping your wall space open for other things. Or put the words up on the cupboards, windows, or window shades if needed. Add a bit of magnetic tape to the back of your word cards and use the side of a filing cabinet. 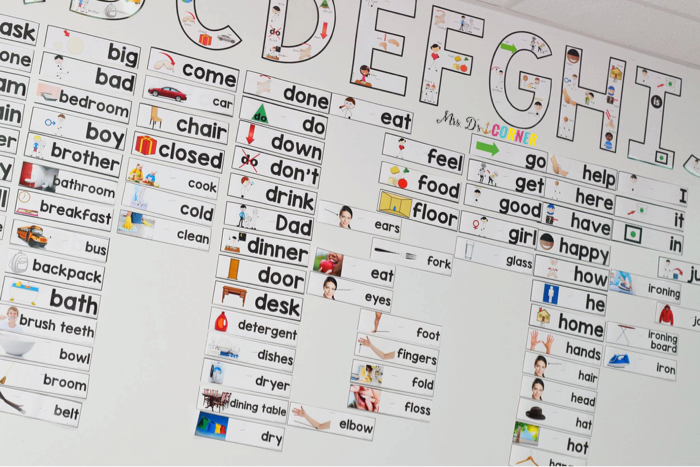 When designing the word wall, place it in an accessible location where all students will be able to view the words. The letters should be in large, black print. Use a white background with colorful images, or different colors on the background to help with the association and visual learning (similar to Core Vocabulary). Select words that are commonly used in speaking and writing (the Core Vocab Starter Kit is an awesome place to begin). Start with a few words, and then gradually add to the word wall as the lessons incorporate additional vocabulary. It can be overwhelming for the students if you start with too many words on the wall. So, the best method is to add the words to the wall as the students learn each word. You can place the word on the wall as part of the lesson. Keeping the information fresh is key to ensure that the students master the words and continue adding to their vocabulary. Word walls aren’t just for “core words” either. Both “core” and “fringe” vocabulary should be utilized throughout the word wall, just make sure that the focus of the words used coincide with the curriculum that you are using. Many resources can help you get started with a word wall. Put together a word collection that you can repeatedly use each year. If you don’t have time to create the printed words, then you should consider using a pre-made kit such as this: Core Vocabulary Word Wall Starter Kit. Would you recommend using a word wall in a kindergarten class with children that have severe and profound disabilities? I have one student about to begin cvc and sight words but the rest are still learning the alphabet. I already have the alphabet displayed in my room! I think you could absolutely have individual word walls for students who are working on CVC words.